The Baseball Card Shop has created this privacy statement in order to demonstrate our firm commitment to privacy. The following discloses our information gathering and dissemination practices for this website: The Baseball Card Shop Online Store. This site contains links to other sites. 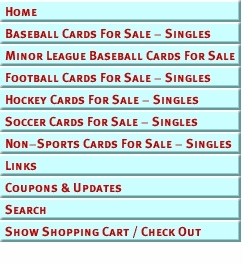 The Baseball Card Shop Online Store is not responsible for the privacy practices or the content of such Web sites. Security This site has security measures in place to protect the loss, misuse and alteration of the information under our control. Choice/Opt-Out Our site provides users the opportunity to opt-out of receiving communications from us and our partners at the point where we request information about the visitor.